Gîte on two (2) levels. 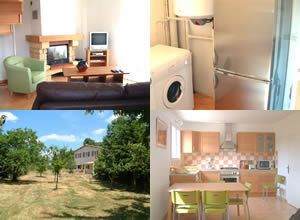 Lounge and kitchen with a chimney (dishwasher, microwave, Satellite-TV, DVD, stereo). Laundry room (washing machine, tumble-dryer). 2 bedrooms (1 bed for 2 people and 2 single beds). One shower with toilet and one shower/tub with toilet. 35m² terrace in front of the gite complete with garden furniture, barbecue and big garden at your disposition (2000 m²), playground. Electric heating. 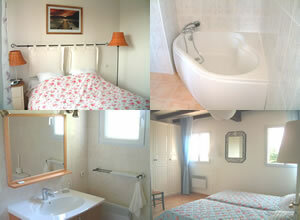 Sheets and household linen (30€) and cleaning service after stay, if required (30€). Move the cursor to move the image.